The house was built circa 1818 and was a typical product of the Regency period in its external appearance, plan and decoration. The building forms part of an irregular and picturesque development of houses all more or less of the same date but varying in appearance within the Hampstead Conservation Area and Downshire Hill. Following a fire and years of neglect the building was in an appalling condition with serious structural failure, exacerbated by extremely poor original construction. At the time of our appointment, it was on the “Buildings at Risk Register” of English Heritage. English Heritage and the Council have agreed that demolition of the existing building was justified. The proposed development sought to replace an existing derelict listed building structure, which detracted from the special interest of Downshire Hill and the Hampstead Conservation Area; and replaced it with a new house which respects the scale of development and tight historic context within the street, and generally makes a positive contribution to the character of the area by sustaining the significance of the heritage asset. 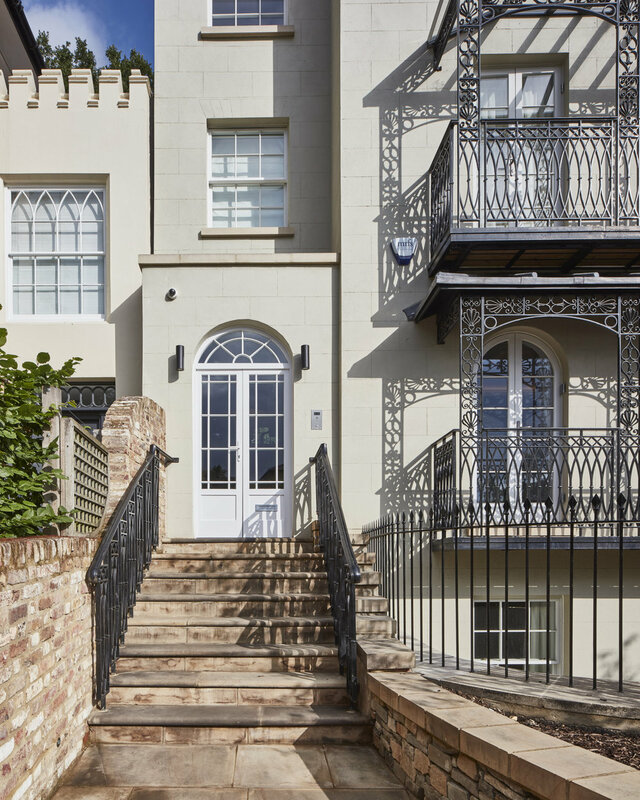 Heritage Architecture Ltd was commissioned as Lead architects from concept to planning submission (RIBA Stages 1 to 3), as well as acting as heritage consultants throughout the planning process. The brief was to provide a new house of appropriate quality to compensate for the loss of the original house. A desire to preserve any surviving historically important elements of the original building and the streetscape has informed the overall design for reconstruction. The guiding strategic principle has been to design the new house, based upon original plan form and historic features as far as evidence allows, whilst incorporating additional accommodation and facilities required by a modern house of this status, outside of the historic footprint. Following objections by local residents Listed Building and Planning consents in 2009 was refused; and the proposal was granted at appeal after Public Enquiry in 2011. The project is currently under construction.